Successors work hard, and many of them succeed and stay for many years. 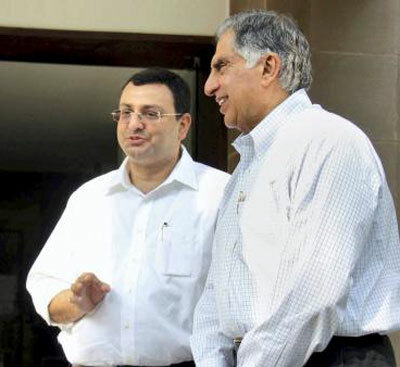 Sangeeta Tanwar on the spat between Ratan Tata and Cyrus Mistry. Family patriarchs coming back from retirement as pilots is nothing new. Michael Dell, Steve Jobs, Howard Shultz and, closer home N R Narayana Murthy, have all come back when the companies they had left were going through troubled times. In some instances, leaders have been more successful in their second stint than their first. So when the board of Tata Sons, the holding company of the $103 billion group, removed chairman Cyrus Mistry and put Ratan Tata back at the helm, albeit temporarily, last week, it wasn't doing anything out of the ordinary. But the similarities end right there. The way things unravelled over the next few days, the allegations and counter allegations emanating from the group and its erstwhile chairman have taken most observers by surprise. Indeed, the incident has critical lessons for India Inc on how clashes can be avoided between promoters and their families on the one hand and the chief executives on the other. The first step to avoid clashes, say experts, is to cast the rules and boundaries in concrete. While departing executives often feel that they are being helpful by staying involved, their successors struggle to manage them while trying to honour their past. The key question is: When is it permissible for the promoter or shareholder to be involved and when not? "Generally, the rule is expressed as the separation of ownership and control -- that is, the owners own the business, but the executives control and guide it," says Morgen Witzel, a UK-based management historian and author of Tata: The Evolution of a Corporate Brand. The owners or promoters should only step in if their investment is threatened, he adds. There are different ways of interpreting that rule, of course, and some activist investors will insist on having a greater say in strategy on the grounds that the choice of strategy affects their investment. At the same time, Witzel argues, to prevent promoters' excessive and undue interference, the CEO needs to articulate a clear vision of where the company needs to go and communicate this clearly to the promoter, along with the benefits he or she can expect to receive. This has been done brilliantly by Paul Polman at Unilever, setting out a different strategic direction for the group and bringing his shareholders along with him. Further, in case of family-owned or established businesses there is also the challenge of managing legacy issues. Often, when a legendary promoter vacates the seat to a professional CEO, the legacy can sometimes linger on and be overwhelming. This also appears to be true in the Tata story where Mistry succeeded Ratan Tata, who was at the helm for 21 years and was known for leading the group's growth and expansion spree not only in India but also overseas. So, how best can a professional possibly deal with such issues? Clear and direct communication is the key here. "If a free hand to the CEO comes with certain lakshman rekhas, be upfront about them. If these are breached, demand a course correction through a direct conversation. Nothing can be more damaging than backroom manoeuvring and creation of alternative power centres in such situations," says Ramesh Vaidyanathan, managing partner, Advaya Legal. Estelle J Toomey, assistant professor and consultant at the S P Jain School of Global Management, agrees. 'Legacy effects' could include direct and indirect influence or even control over everything from the overall vision of the company and associated strategic goals to shaping internal and external policies and operational practices. "Therefore, expectations of families truly relinquishing power need to be realistic based on clear roles and scope for decision-making established through both relationships and a solid legal framework," explains Toomey. That said, the new leader needs space to manoeuvre and needs to also earn trust. "The initial trust that board members place in a CEO during the hiring processes will deepen with continued interaction over time," says Brian Moriarty, director of the Institute for Business and Society at the University of Virginia's Darden Business School. Directors should allow the CEO to do the job of managing the company, give him the leeway to shape the role in his own image and recognise there will be some differences of style and approach from the predecessor. "Part of the board's role is to provide continuity for the company, so there needs to be some balance here," adds Moriarty. At the same time, a CEO should respect the role of the board and welcome their service, insight and expertise. "Trust emerges from being united in purpose and working together toward the same goal," he adds. "Therefore, in order to move forward, a leader needs to be both genuine and strategic with investing time and effort to continuously nurture support from a broad base of stakeholders, as well as with specific members of the power elite within the enterprise and within the extended family structure," says Toomey. "Otherwise, it may be just a matter of time before one loses sight of the potential impact of these factors, often becoming over-reliant on elements of business success to serve as a buffer to them or to offset perceptions of failure,” cautions Toomey. Taking specifically of the Tata group, Kavil Ramachandran, executive director, Thomas Schmidheiny Centre for Family Enterprise, Indian School of Business, says, "The key question is whether the company and the management had enough of scenario-building exercises before taking key decisions or setting the agenda for the group after Mistry took charge." For example, as a leader, instead of focusing on a few key ideas and decisions at the top level, Mistry could have constituted different committees of the board to recommend plans. This would have ensured that "the changes driven by him would not appear to be his decision or agenda alone." "And that's the job of a leader -- taking everybody along. The board is the ultimate -- so taking everybody along matters. But equally there is no evidence that as a leader Mistry did not do this," says Ramachandran. Successors work hard, and many of them succeed and stay for many years. "But when they don't it is best to be civil and part ways than seek confrontation which might prove acrimonious and futile," says an executive with a firm that is among the handful to make a smooth transition.